The perfect (and easy) way to surprise your scout with a special care package! Available in limited quantities, the Owasi-Pack is a draw-string backpack care package filled with some treats that your scout is going to love! A pre-stamped Owasippe Postcard to send a note home from camp – likely thanking you for his Owasi-Pack! Orders close the Sunday before your Scout's week at camp. **All Owasi-Pack snacks are nut free, such as Rice Krispy Treats, Oreos, Fruit Snacks, Rold Gold Pretzels, Skittles, Starburst, Airheads, Charleston Chews, and/or Cheetos. 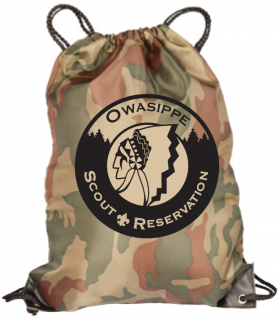 **Unit leaders will receive notification when an Owasi-Pack is available for pick-up in our trading post.